A bevy of Shakespeare productions are currently taking place in a pop-up Elizabethan-style amphitheatre in York, England. Based on the Rose, a famous Elizabethan public playhouse in Southwark, London, and named after it, the construction sits in the York’s castle car park. Indeed, car parks seem to be intersecting with English history quite a bit lately. Most famously, Richard III’s skeleton was discovered underneath one in Leicester in 2013. It’s appropriate, then, that one of the first plays to be shown in York’s replica theatre will be Richard III, a tribute to the city’s infamous son and one that resonates in a slightly macabre way with the site of the 2013 discovery. Performance Studies’ heavyweight, Richard Schechner, famously asserted that while not everything is a performance, anything can be studied as a performance. This contention can be applied to car parks. It is hard to imagine a symbol of modernity more brutish than the architectural monstrosity of the multi-storey car park, with its layer upon layer of automated machines. The relentless appropriation and occupation of public space signalled by concrete car parks stand in stark opposition to the delicate skeletons, historical timbers and green landscapes that they have erased and replaced. But of course, car parks are themselves subject to a history that they both influenced and propelled during the 20th century. The first multi-storey was built at Denman Street in London in 1901, and the company National Car Parks (NCP) was founded 30 years later by Colonel Frederick Lucas. The remarkable rise of NCP was predicated on its regeneration of the derelict sites of post-war Britain, transforming bombsites into parking spaces in a way which helped to mould the revival of towns and cities, as well as their definition as centres of consumption. The role that NCP has played in shaping the consumerism of 21st-century British national identity means that there is a curious tension between the socialist overtones of the company’s name, and the extraordinary success of this private company, which posted profits of £28m in 2016. While car parks seem to be a firm aspect of our present, they have sometimes also assisted in keeping the past alive. In Detroit, the former Michigan Theatre is often acknowledged as the most beautiful car park in the world, originally a French Renaissance-style venue established in 1926 that fell into decline alongside the city in the 1970s. Its transformation into a garage means that drivers can still marvel at the theatre’s decaying glory when they visit Detroit. Park up and admire its great arched window, faded decorative ceiling, ruined remnants of carpets and curtains, the façade of its abandoned stage. Without the car park, all of the building’s languishing grandeur would be invisible. But the building has even more to offer history than first appears as, funnily enough, it was constructed on the site of the Edison Illuminating Company, where Henry Ford built his first car in 1896. 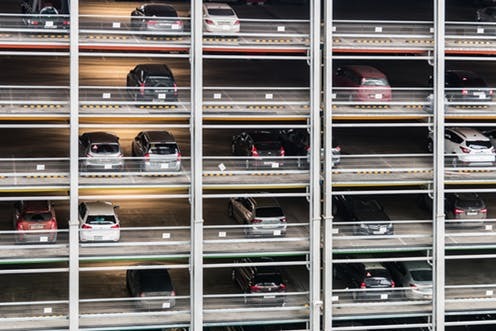 Car parks can therefore tell us something about our cultural genealogy – and increasingly, genealogy is a primary way that we conceptualise our connection to history. The growth in popularity of websites offering saliva tests to determine your ethnic origins or TV programmes focusing on family lineage – whether the DNA tests of the Jeremy Kyle show or the uncovering of Danny Dyer’s royal ancestry in Who Do You Think You Are – attest to this. This is enough of a phenomenon that interdisciplinary researcher Jerome de Groot recently launched his Double Helix History project, an investigation into the ways in which “DNA sequencing changes the way that people think about themselves and their relationship to the past”. It is telling how many times DNA also recurs in the language surrounding theatre and car parks. James Cundell, chief executive of Lunchbox Productions, who are producing the shows at Shakespeare’s Rose, claims an “ancestral link”, for instance, with Shakespeare’s First Folio as a distant relative of one of its editors, Henry Condell. And in 2013, DNA proved crucial in confirming that the Leicester car park skeleton was in fact Richard of York, his identity authenticated through the genetic testing of living relatives. Multi-storeys even exhibit what their architects call “double helixes” in the design of ramps, which mean that cars ascending the car park never converge with those on their descent. These ideas may seem provisional, coincidental, unconnected, comical even. But looking at car parks as a performance, their recurrence in recent history is intriguing. It is possible that in this new car park theatre, we’re witnessing the work of British collective memory in action and that, in the future, car parks will perform a quite different role in our history than they do at present. A future site of cultural memory? The car park has already taken on an almost mythic status in the Richard III narrative for instance, irrevocably linking English history, and Shakespeare’s play, with this supremely modern invention. Elsewhere, de Groot has written about how the object of the Royal Oak, in which Charles Stuart hid in 1651, has taken root in English cultural memory in surprising ways, manifesting in pubs, on coins, or the name of warships, becoming “a site of tourism and memory, something to be owned, a place to drink, something to spend”. Is it completely unfeasible that the car park might perform history in the same way as the oak tree in time to come? Car parks, currently perceived as sites of modernity that must be dug up or covered over in order to access the “truth” of pre-modernity, may in time emerge as objects that are more delicately-intertwined with British memorial culture than they currently seem. This entry was posted in FEATURES and tagged British culture, Shakespeare. Bookmark the permalink.